Description / Abstract Becoming a “Korean American” in some ways had been an alienating experience for my grandmother as she navigated assimilation into American society. My grandmother’s immigration story has influenced the research and historical aspects of this project. 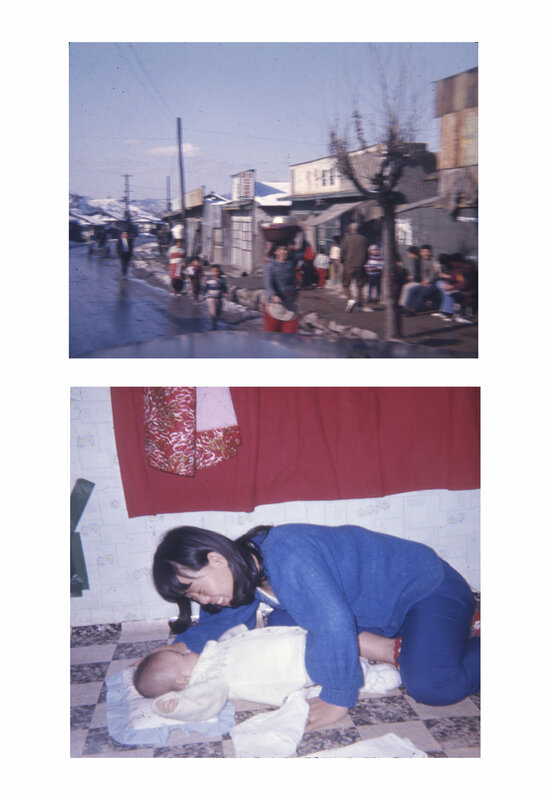 Through film photographs of my grandmother’s life back in South Korea, and earlier years in the United States, I created a parallel of imagery with my own generation and recontextualize the Asian woman immigrant’s reconciliation with motherhood, domesticity, and the loss of identity. Along with processing and printing these older photographs, I took film photographs that confront western ideals of the exotic Asian woman and the colonization that affects future generations by reclaiming the Asian woman body and image. In this part of the project, I engaged with other individuals of Asian communities that are woman identifying, asking about their families’ heritage and story of immigration. By combining two types of photographic images of found and contemporary portraiture, the juxtaposition between the past and present display the residual of their Asian heritage, it’s transformation here in the U.S., and generate a discussion of taking back the domestic Asian femme stereotype. I printed these photos in the Darkroom or Cellar Print Lab and they will be matted and framed to be hung in the gallery at the Elena Baskin Visual Art Department UCSC May 4-10, 2017.